Adventures that bring together children and parents in which the unique passions and talents of the child come to life in a customized storybook series. Parents and kids embark on missions together in which your child becomes the hero! Question: Can we use open ended art as a springboard for a child to create his own story? 1. Encourage open ended art on post it notes. Let the child draw as many pictures as he wants. Nameless shapes, lines, and scribbles are welcome. 2. Let the child know that his pictures will become his very own story. 3. Lay one picture at a time in front of the child. Begin by saying, "once upon a time..." Let the child build their own story. Offer encouragement and minimal input when needed. Question: Can we practice humility by encouraging someone at the park? 1. Prepare the child by telling him that your mission at the park today is to encourage someone. 2. Ask, "Do you know what encouragement is? It can be when you tell someone good job for doing their best. "Wils, you are getting so good at climbing at the park and learning so many new tricks!" "Quin you are getting stronger and stronger and one day soon you will walk!" 3. 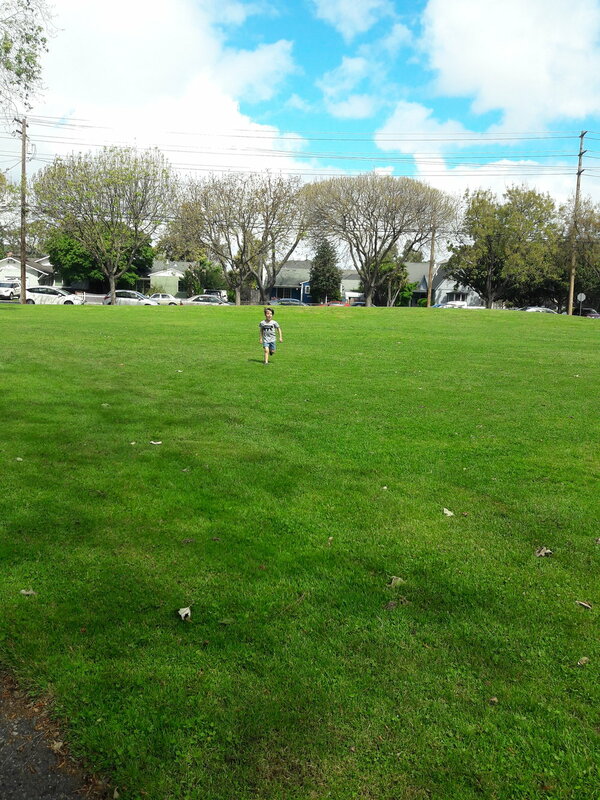 Invite the child on the mission of encouraging someone at the park. 4. Model encouragement. "You are a fast runner!" I say to Wils' new playmate. "Wow! you are a very friendly girl"
Wils gives flowers to our new friends. Question: How easy is it to use our words to practice our virtues at the park? A friendly lady tells Wils he is great! She wants to see how fast he can run! "You are a fast runner!" she says. "Thank you for telling me I am fast. You are nice!" Little girl ask, "Can I play with you?" "Yes!" What joy bringing words! Off they went to have a great time together. 1. Prepare the child for bringing joy to the park. Say, "You are a joy bringer! Today we get to say something to someone that will bring joy!" Give the child examples of what they can say. "I like the way you are climbing!" "Your going really high on your swing!" Ask the child how those words would make someone feel. 2. Arrive at the park. Remind the child of their mission. Play naturally with the child and wait for an opportunity to arise to bring joy to someone. 3. Model being a joy-bringer and invite the child to do the same. Point out when someone says something that brings you or the child joy too. "Wow, she said _____________. She's a joy bringer too! What will you say now?" 4. Say goodbye to your new friends and take the walk or ride home to talk about what happened at the park. "Who did you play with?" "How did she bring joy to you?" "How did you bring joy to her?" "How did you feel?" "Did you have fun?" When the child experienced the virtue of joy for himself he was inspired to give it away! Bringing a virtue to the park is not only about what the child can bring, but there is plenty of opportunities to talk about how other people are virtuous as well. This was really fun! A friendly woman came up to the child and told him that he was great and wanted to see how fast he can run. This was a great start because she used her words to bring him joy. I was able to ask the child what he wanted to say back to her. Then a little girl asked if he can play with her. I was able to point out how much joy her words brought as well and prompt him to respond to her with joy. I had someone to speak with too, so on the way home we talked about how we were all joy-bringers at the park! Question: Will telling a story centered around a virtue bring more understanding to that virtue? Let's read a story together! Do you remember when your friend shared his sand toys with you? How did that make you feel? Larry brings joy to kids all around the world! "You shared your bubbles with me today. That brought me so much joy! You are a joy bringer! How else can you bring joy? 1. Read "Bali the Joy-Bringer Elephant" to the child. 2. Celebrate and document a time when the child brought joy to someone. 3. Give the child the opportunity to plan another way to bring joy to someone. "Bali the Joy-Bringer Elephant" created an excitement over bringing joy to people. We should consider creating a series of books in which we can represent each virtue. Receiving a virtue spoken over him, "Joy-Bringer," became a part of his vocabulary. Proactively relates to his life--brings toys to the park to share with kids so he can bring joy. Question: Can we insert a super power into a story previously written by the child? 1. Read a story that was previously created by the child. 2. Pause together to consider which super powers were used. 3. Allow the child to offer his ideas, and then offer your own. 4. Discuss how those super powers were used. 5. 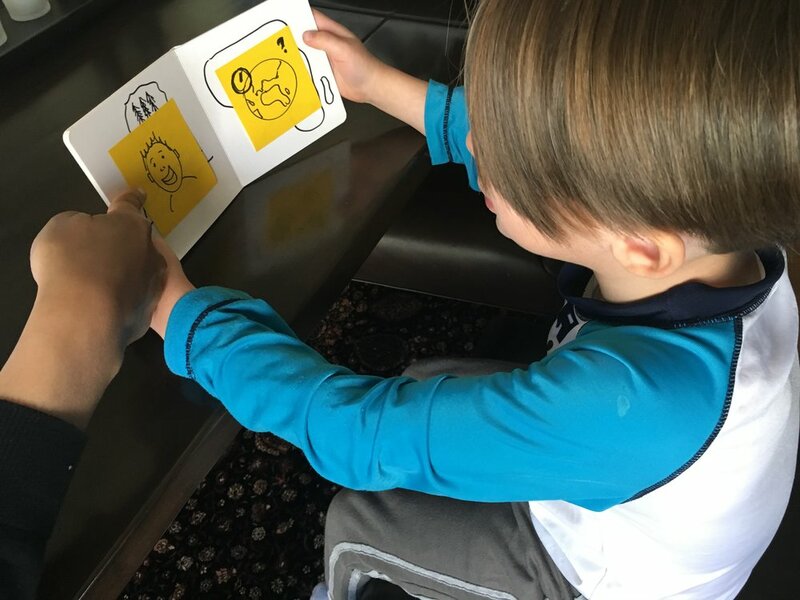 Document the super powers at the end of the story and inside a passport using stamps. 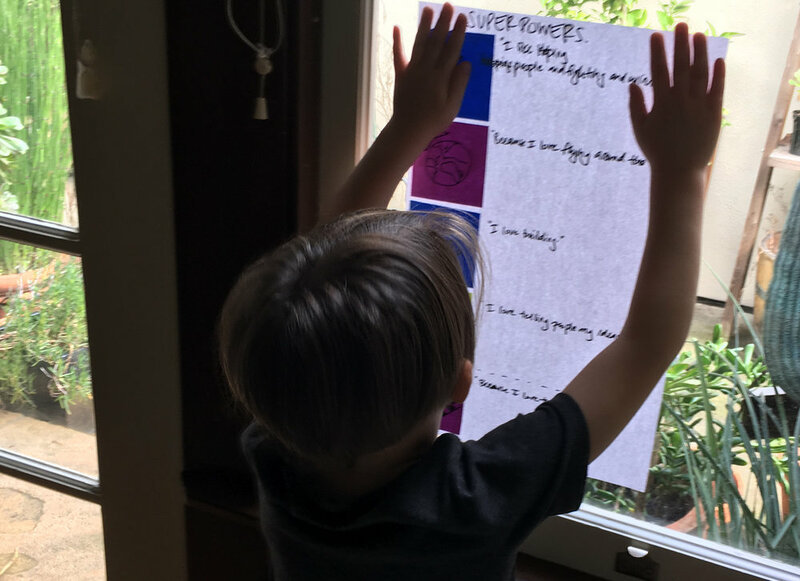 The child was able to recognize the use of a super power in the story. 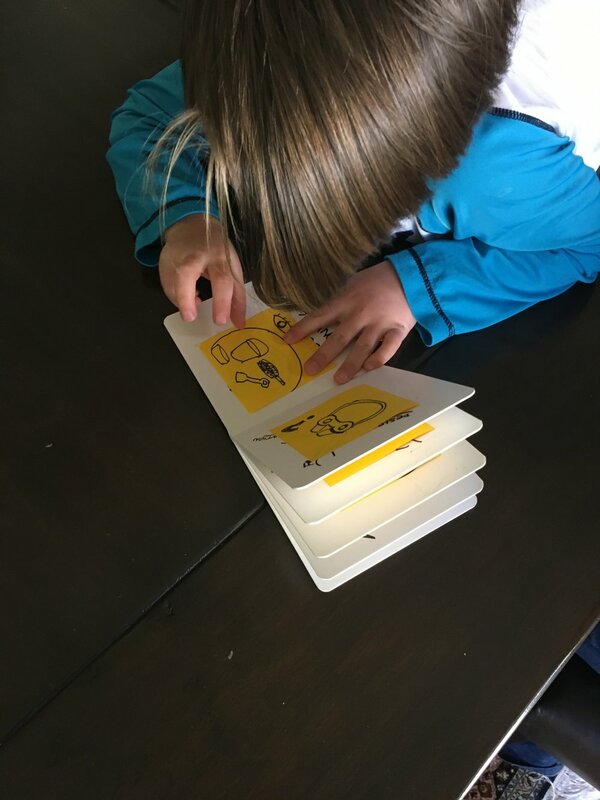 In addition, the child loved reading a story he created all by himself in traditional storybook format. It may be a good idea to have children create their own personalized library. . The child related the "Crown" super power to saving the penguins in the story. "I am fast! "I am strong!" Question: Would a passport be a fun and effective way to document super powers? Question: Is it fun and natural to amplify a super power? Choosing to create a gift to give. Wow! Did you know that you are a gift giver? Now your a Mega Builder! Can we hang it up? 1. Direct the beginning of the story. 2. Present a dilemma that the characters face. 3. Ask the prompt question. "Which super power will you use?" 4. Allow the child to direct the ending of the story. 5. Present the child with new super powers. It was fun and natural to amplify the "Builder" super power to the "Mega Builder" super power. The child was able to spontaneously use a super power as well. He was very excited to find out he had been a "Gift Giver!" The child was able to intervene in the story. Question: Will kids pick Superpowers that reflect their true strengths? Lay out color-coded Superpowers with icons and let the child choose the top 3. Ask why the child chose those three and capture what they say under each. 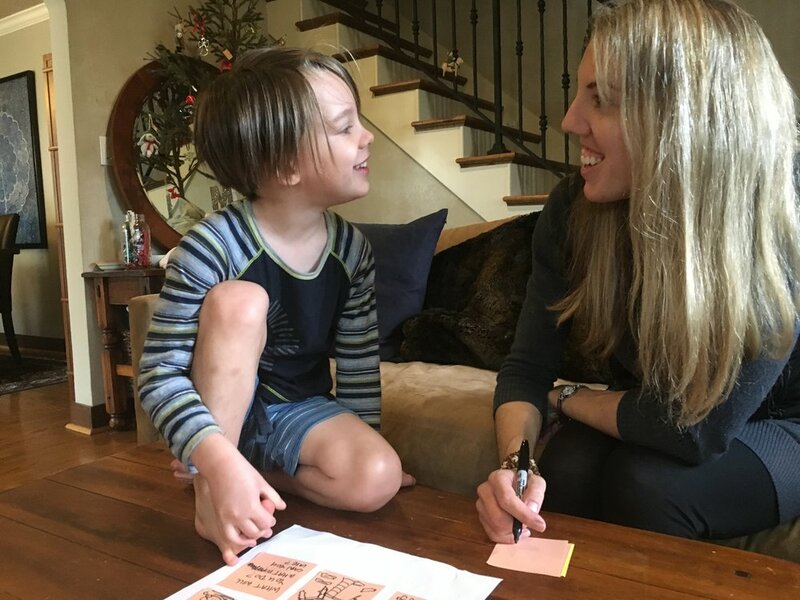 Let the parent select from the set of color-coded "I" statements that they most often hear their child say and see whether the colors roughly line up with the colors of Superpowers the child chose. Choice is hard! Favorite quote: "I'm ALL of these!" Best for the kid to select superpowers from the visuals and parents to select from the "I" statements. Question: How do kids respond to seeing themselves as the character in their own story? 1. 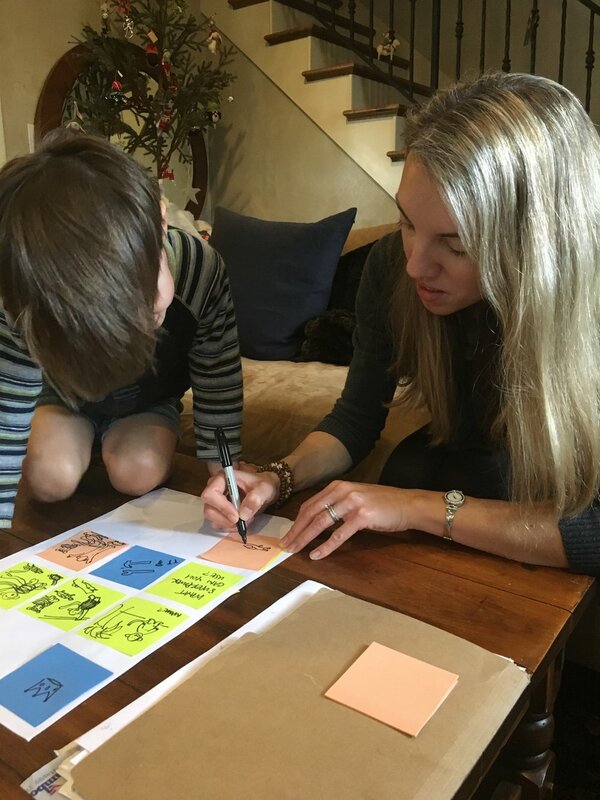 Complete the purpose exercise (either with your child or with another family member) to identify your child's unique passions, talents/gifts and what they care about in the world. Take a photo of your page and a photo of your kiddo and email to jess@ebydesign.org. 2. Sketch (or ask us to) various tools and artifacts your child might need for his or her adventures. Have your child pick from the various tools and hear why s/he made those selections! 3. Ask your child to pull 3 pages from a magazine (with inspiring scenery or people interaction). Have your child tell you a story about each photo and what his/her character hero does, using which tools!